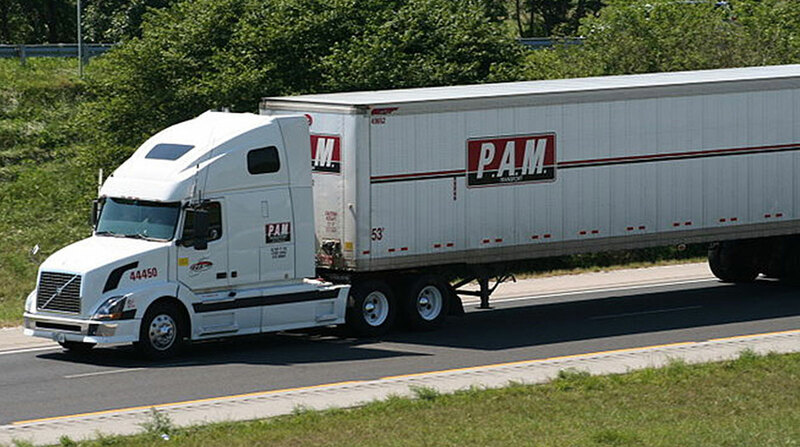 P.A.M. Transportation Services Inc. reported a surge in net income and stronger revenue for the second quarter amid lower operating ratios, respectively, at its truckload and logistics units. Net income for the period ended June 30 jumped to $7.3 million, or earnings per share of $1.17. A year earlier, net income was $1.6 million, or 25 cents. Revenue rose 21.5% to $113 million, not including fuel surcharges, compared with $93 million in the 2017 period. The truckload unit’s operating ratio improved to 90.3 from 96.9 a year earlier. At the logistics unit, it was 94.4 compared with 97.4 in the 2017 quarter. Operating ratios show a carrier’s expenses as a percentage of revenue. They are used as an indication of profitability and financial health, and a lower ratio is better. The company had set as its target in the quarter results from its 2015 second quarter but failed to reach that goal — although it improved on results from the 2016 and 2017 similar periods. “One notable difference between the second quarter of 2018 and the second quarter of 2015 was that in 2015 we recognized almost $1.6 million more in pretax gains on the sales of our used equipment. This difference ended up being the primary difference between falling short of the targeted 2015 financial results and matching those results,” P.A.M. President Daniel Cushman said in a company statement. P.A.M. reported “tremendous success” in growing its Mexico service offering and year-over-year second-quarter revenue in that division up by almost 30%. Revenue for the second quarter in its logistics division more than doubled when compared with the second quarter of last year — rising to $23.7 million compared with $11.4 million. Dedicated freight opportunities increased in the quarter, too. “Our business mix is now comprised of over 50% dedicated or quasi-dedicated business, which we believe provides our driving professionals with some of the best, most consistent home time opportunities in the industry,” Cushman said. At the truckload unit, revenue per total mile before the surcharge rose to $1.56 compared with $1.39 a year earlier. Total loads climbed to 103,511 in the quarter compared with 84,726 in the 2017 period. In the quarter, the average number of company-driver trucks was 1,324, up from 1,219 a year earlier. The average for trucks driven by owner-operators fell to 550 from 673. During the remainder of the year, the company expects fleet growth of about 20%. P.A.M. in the earnings report underscored its broadening to shippers of all kinds. P.A.M., based in Tontitown, Ark., operates throughout the continental United States and in the Canadian provinces of Ontario and Quebec. The company also moves freight to and from Mexico through gateways in Laredo and El Paso in Texas under agreements with Mexican carriers. P.A.M. ranks No. 71 on the Transport Topics Top 100 list of the largest for-hire carriers in North America.